Inclement weather caused by typhoon Kong-rey wiped out Saturday's action at an LPGA team competition in South Korea. 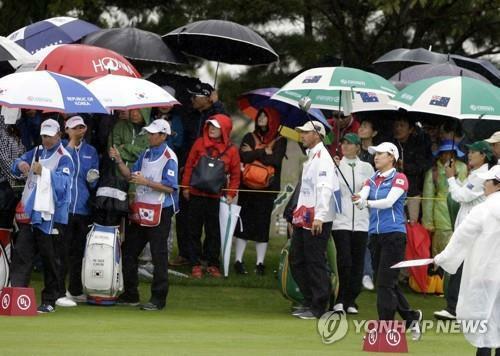 The LPGA announced the cancellation of play on Saturday at the UL International Crown for 32 golfers in the field at rain-soaked Jack Nicklaus Golf Club Korea in Incheon, 40 kilometers west of Seoul. It said the course was inundated by heavy rain overnight and the forecast called for strong winds later in the day. The LPGA moved up tee times for the second round of four-ball action on Friday, and the players also got in a few holes for the third round Friday afternoon before play was suspended due to darkness. Eight teams, including host South Korea, have been divided into two groups. After three rounds of four-ball match play, the top two teams from each group plus the wild card winner will advance to the singles on Sunday. The LPGA said the rest of the third round will resume at 7:05 a.m. Sunday, and the singles matches will soon follow -- with the hope of finishing the competition on Sunday. In four-ball, players each hit their own ball, and the better score of the two becomes that team's score on the given hole. Each match victory is worth two points, and a halve (a tie) is good for one point. When the third round was suspended, South Korea was in second place in Pool A with six points from three wins and a loss, one point behind England. The defending champion United States was leading Pool B with six points. South Korea was facing England in the third round. Park Sung-hyun and Kim In-kyung were leading Georgia Hall and Charley Hull 4-up through eight holes. Bronte Law and Jodi Ewart Shadoff for England held a 1-up lead over Ryu So-yeon and Chun In-gee through six holes. Thailand and Sweden were the first teams to tee off in the third round. Moriya and Ariya Jutanugarn for Thailand and Anna Nordqvist and Caroline Hedwall for Sweden played the most holes with 14, with the Thai sisters taking a 3-up lead.